So Jerome Valeska officially returns in Gotham season 3’s January mini-arc. He’s not officially the Joker yet, so Jerome being an inspiration for a future Joker is still possible, technically, but is there enough evidence now to suggest that it’s just a matter of time before Jerome wants a proper stage name to suit his actions? It’d be a nice twist on the Joker origin story. Certainly being murdered, having a fan – a true fanatic fan – steal your face, and being continually outdone and betrayed by your patron would destroy any hope of you leading a normal life. And it’s definitely a backstory that no other Gotham villain can yet trump, lining Jerome up for top spot job on the supervillain, evil roster. Also there’re the little hints – and I wonder how many I’ve missed. How did you take to that line from the security guard in the opening scene about jokers being wild? Somewhere else in the plot it would perhaps have been too forced but at the start of the episode when you’ve not seen too much of Jerome yet and delivered by side character I thought it fitted. All of which leads us to reconsider an obvious question: is Cameron Monaghan’s Jerome a good Joker? I’d say he does have the threat value for it that comes with Monaghan’s delivery of the criminal insanity. I’d also say that I was excited by the idea of Jerome meeting his disciples and particularly what he might do with Dwight when they finally met up. Admittedly I’m not sure I can say that this potential version of the Joker is a completely different interpretation of the character – not totally unique. Is that too much of an ask though? ‘We want you to be new fresh and original, just like all the other Jokers that have come before you.’ And he has to fit in with the over-the-top comic-book style of Gotham as is. Certainly what Monaghan has delivered fits the show we have: he puts on a great show, he’s believably insane and carries the threat value with it. In fact the only thing that really bothered me with Jerome’s return was the time it received at the end of the episode. The first half of ‘Smile Like You Mean It’ seemed to set a great base line for the structure of Gotham episodes, matching even what a lot of us thought would be the focus of the show: It has Jim and the villain of the moment centre stage, with two accompanying side plots. In this case one was Bruce’s, whose deserved popularity has given him regular screen time, and the other Penguin and Nygma’s. In the first half these side stories develop a smaller plot point each and never seem to get in the way of the main one. In the second half though, I think the side plots start to fail to some degree. Catmom’s con is a good idea and perfectly fitting for the not-so-nice person she’s turning out to be. Even better we get to see a powerful argument between Bruce and Cat that once again is not just the drama between them but something that also shows the differing ideologies that promise to lead to a difficult attraction between Batman and Catwoman. That one moment where Bruce refuses to fight Selina is a perfect example of everything I want to see in both writing and delivery from these two characters – top notch. I have to ask: Have you seen my face? So what’s my problem? Just the timing in the second half of the episode: Right when we’re really building the tension through the siege of the TV studio and the expectation of Jerome meeting his new followers we keep getting interrupted by off-topic thoughts and feelings. 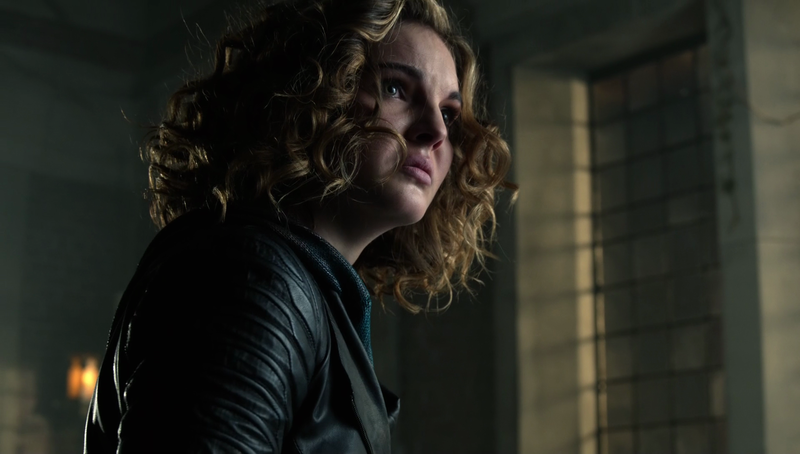 I wanted to see Selina face off her mother but perhaps just earlier on, leaving the siege and Jerome’s plan to pull the city into despair in a single downward fall. Penguin vs. Nygma seems to suffer even more. We’ve been building to the war between them for some time now and it’s a deeply personal battle that could really be upsetting but it’s coming in now as a side plot to the main feature. It feels like it’s been relegated to the bench because there’s a better player stepping up, especially because the Court of Owls’ promise of an imminent chaos now seems to more likely refer to Jerome’s fanatics’ assault on Gotham City. It could well have referred to the devastation that followed the two worlds of Oswald’s kingdom – legal and criminal – either tearing themselves apart or colliding. Perhaps Jerome is going to be happy at least that he’s managed to upstage someone. And I’m fully aware that this plot needed to fit into three parts to fit the TV schedule, so Jerome needed to hold off some of his evil ‘til next week. Still though, I think there was a better candidate to fill this airtime. 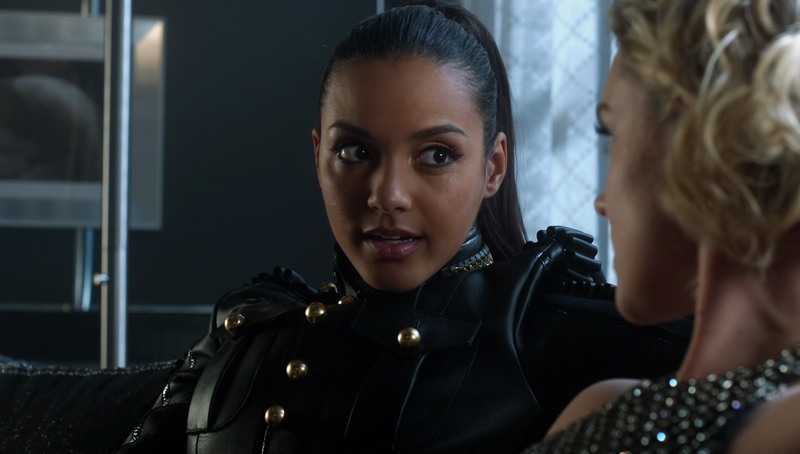 As it is the Penguin-Nygma plot needs some annoying exposition from Barbara and Tabitha to cover Nygma’s plan and the ‘option B’ gag just wasn’t funny enough to stand up against the power of Jerome’s return. Perhaps in place of this we could have seen more of Dwight as new prophet of the rising religion? Using Jerome’s face was a nice play on the Red Hood concept that fits in well with the current mentality of Gotham’s people and it’s a clever idea. By telling the downtrodden people that they were all Jerome, Dwight gives them the power they all crave and with a simple – if truly disturbing symbol – they can rally behind. I would have loved to have seen this new prophet be seduced by the power this gave him for the rest of this episode, which in turn may have made his downfall at Jerome’s hands all the greater. Gotham does like to take its Sunday drives in 6th gear though, so Dwight’s short time on screen only fits the norm. Plus, I acknowledge that this speed is a matter of personal taste. As long as there aren’t too many plots vying for attention I won’t say it’s a bad thing, I’ll just stick with the comment that the Penguin-Nygma plot didn’t really make the bar set by its fellows this week for me. If ‘Smile Like You Mean It’ had kept to the pace of its first half I think I would have loved this episode. I am truly excited to see what Jerome and his followers will do next. 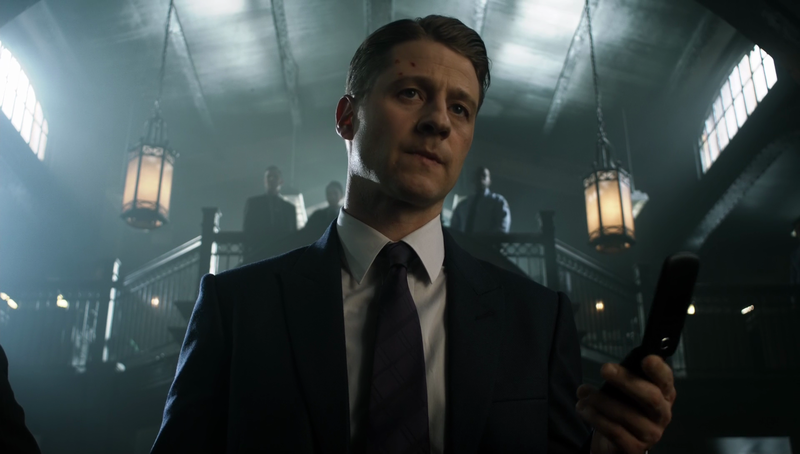 Jim Gordon is still showing the intelligence that will earn him the role of commissioner with moves like his bluff with the mobile phone. Plus Camren Bicondova and David Mazouz just don’t seem to be able to put a foot wrong. 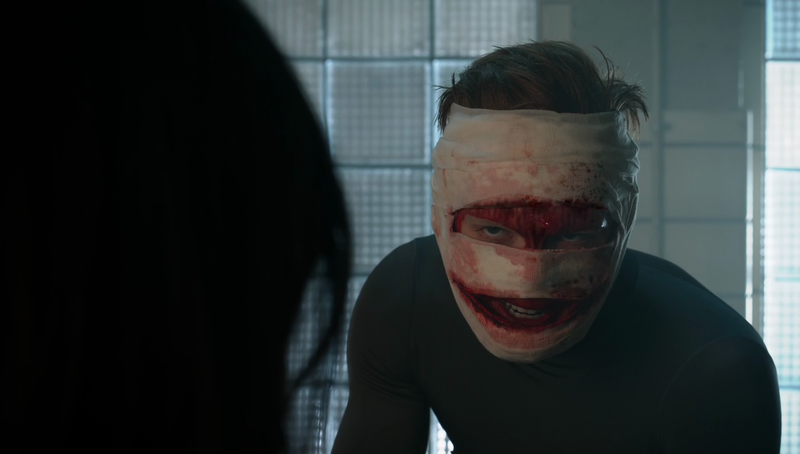 Add to this the development that has gone into bringing back Jerome throughout the series, leading to this interesting twist on the Joker’s origin story (I’m still assuming), and you’ve got some terrific plot. As it is I think trying to get the Penguin-Nygma battle into the same mini-arc as Jerome’s return was probably too big an ask. 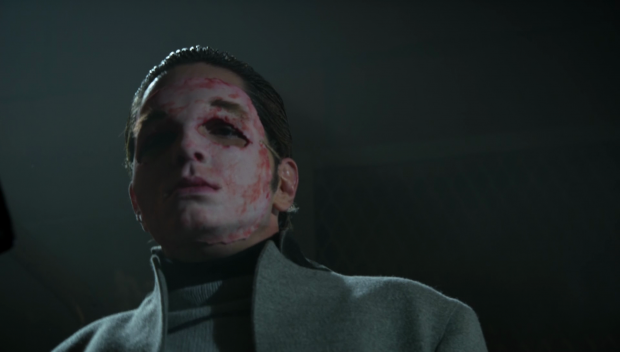 Jerome came through it very well but we’ve seen much better from both Penguin and Nygma before. I have no idea how the final episode of the arc will manage to handle it but perhaps the city under siege will force Penguin and Nygma into a confrontation that equalises their power somehow – that could really work.